The X-Men are attacked by mysterious soldiers. 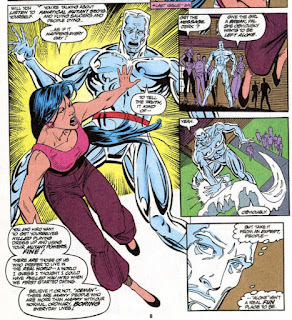 Outside Opal's home, Rogue, Bishop & Iceman fight off a group of armored soldiers whom Cerebro detected as genetic anomalies, each of whom collapses into a chemical ooze upon defeat. 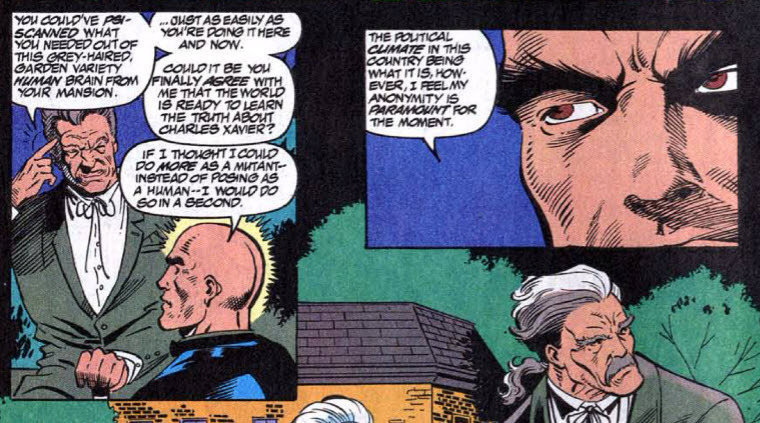 Meanwhile, in Washington DC, Professor X & Storm meet with Ambassador St. Croix, a member of Xavier's Mutant Underground. Aboard the Blackbird, the X-Men attempt to interrogate one of the soldiers they captured, but when he refuses to talk, Rogue touches him, causing her body to mutate horribly to mimic. 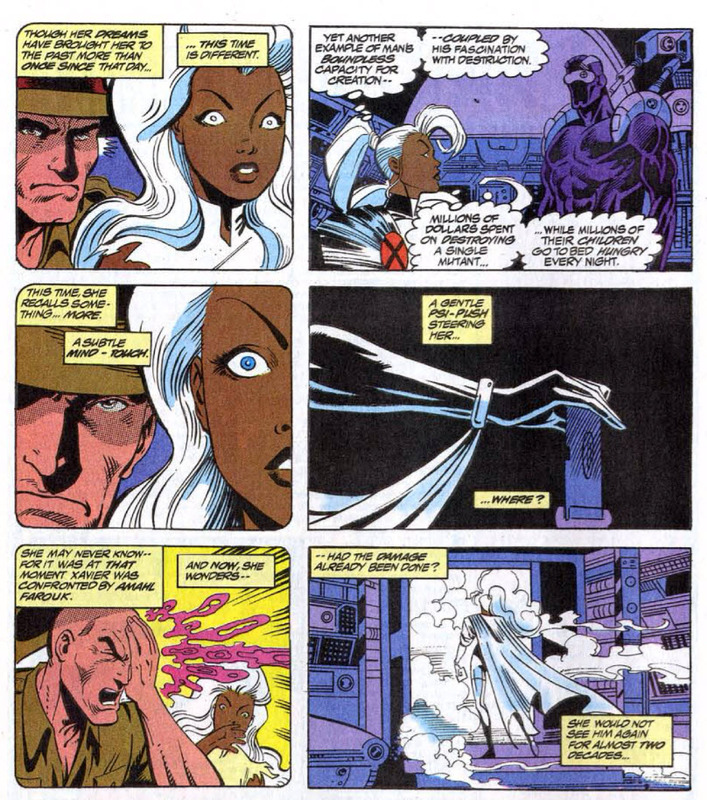 In DC, Xavier asks Storm to steal an exo-suit designed to shield the wearer from Magneto's electro-magnetic senses. 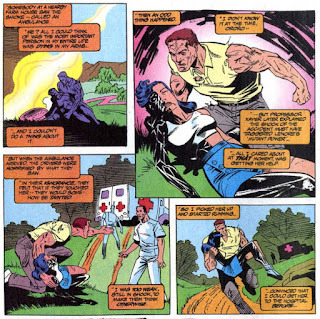 Aboard the Blackbird, Bishop tackles Rogue, causing her to absorb his memories before her body returns to normal, after which she tells her teammates that the soldiers were like skin & tissue stuffed into armor and programmed to destroy them, with the only thought she was able to discern a name: Hodge. Back in DC, Storm steals the design schematics for the exo-suit, but does not destroy the prototype, telling Xavier that humanity has a right to defend itself, and to not ask her to steal for him again, that the X-Men need to be better than that. 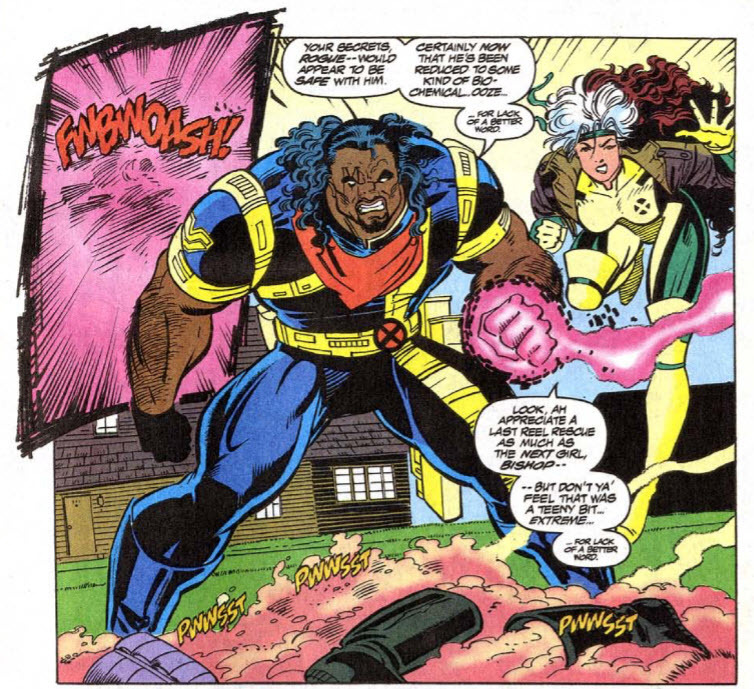 The X-Men fight a group of anti-mutant soldiers in this issue, which turn to goo when defeated (and turn Rogue into a weird ribbon-y creature when she touches one of them); they will later be revealed to be early prototypes of the techno-organic Phalanx who will menace the X-Men in the next linewide crossover. They are targeting Iceman's girlfriend, Opal; things remain rocky between them, she breaks up with him formally, marking her final appearance until Iceman's 2001 limited series, a somewhat ignominious end for a character who was a relatively big deal in the closing days of the original X-Factor run and survived that group's re-assimilation into the X-Men. 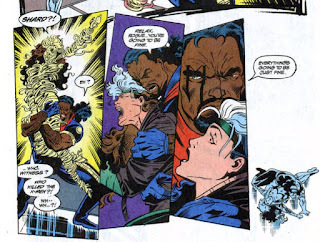 After touching one of the proto-Phalanx, the only thing Rogue is able to get from its mind is a name: Hodge, a reference to Cameron Hodge, last seen (presumably dying) at the end of X-Tinction Agenda when his head was buried under the Genoshan Citadel. True to the deal he struck with N'astirh back in "Inferno" era X-Factor, Hodge will shortly return, alive (sort of), as a member of the Phalanx. Xavier meets with Ambassador Louis St. Croix, a member of his Mutant Underground, in this issue; Louis will make only one more appearance after this issue, but he'll eventually be established as the grandfather of future Generation X and X-Factor member Monet St. Croix aka M, her sisters, Penance (it's complicated) and their brother, the villainous Emplate. 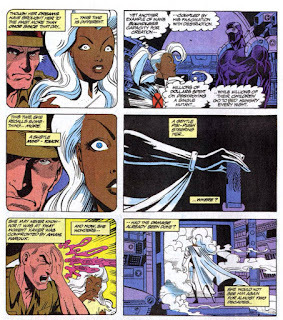 The multi-government plot to assassinate Magneto from X-Men Unlimited #2 is referenced, and Storm later steals the plans for the Magneto-proof suit worn by the assassin at Xavier's request, though she does not deny the government access to them for future use, saying humans have a right to defend themselves. Jan Duursema (incorrectly spelled as "Duuresma" here), continuing to expand her foothold in the X-office en route to regular penciling duties on X-Factor, fills in on this issue. 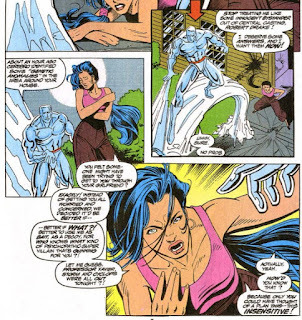 Upon figuring out that Iceman effectively used her as bait, Opal gets in a good dig about how Cyclops, Storm and Professor X must have been out of the mansion when he came up with that idea, and he admits they were. At a government cocktail party, the damage caused to Weschester County by Magneto last issue is said to be costing millions, though the art last issue failed to convey damage on that scale. 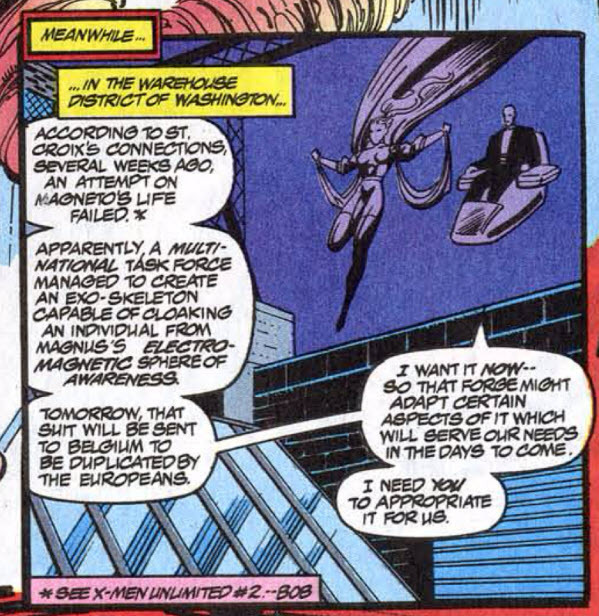 The government's Magneto Protocols are also referenced again. 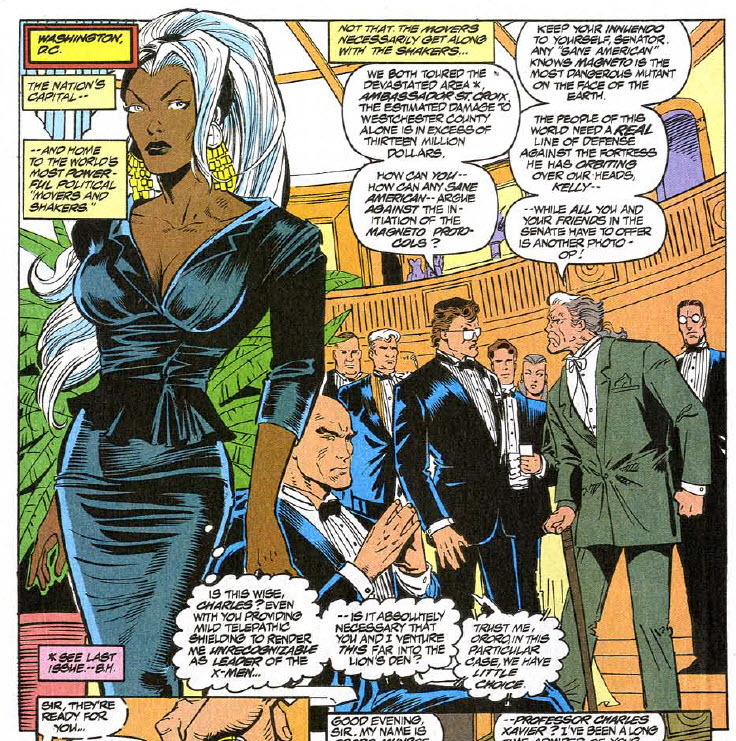 With Storm appearing in public alongside Xavier, it's said that he's telepathically masking her appearance so that no one will realize he's with one of the X-Men, a reminder that the X-Men, despite being officially outlaws to varying degrees, don't really wear masks or do much to protect their identities. 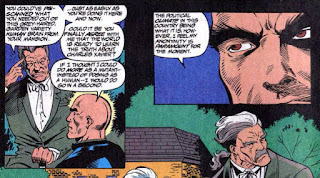 Xavier discusses coming out as a mutant with St. Croix, and says he would do it if he thought it would make things better for mutants, a reminder that the world at large still doesn't know that famed mutant rights activist Charles Xavier is a mutant. 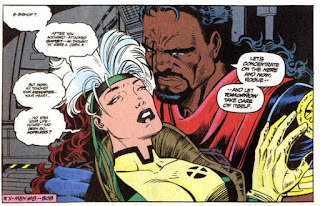 After Bishop touches Rogue, she mentions his sister, and also reminds us about the whole X-traitor plotline Bishop was all about when he first arrived. 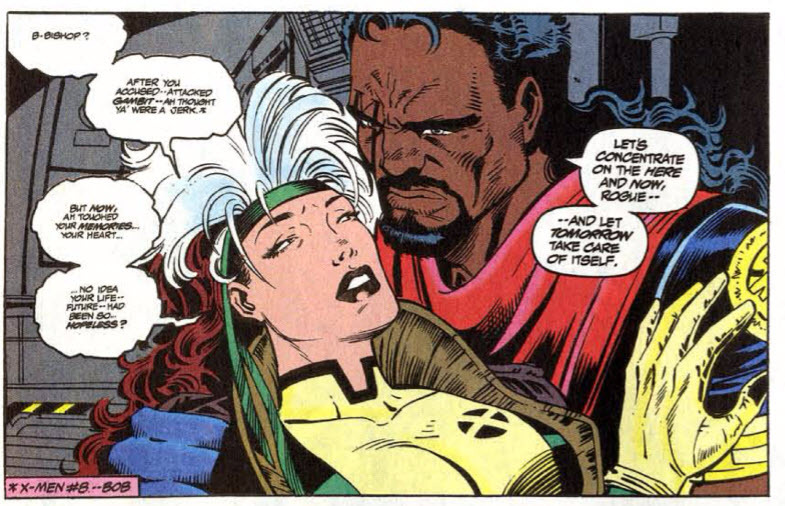 In the wake of absorbing his memories, Rogue apologizes to Bishop for the way she treated him after he joined the X-Men (circa X-Men #8). 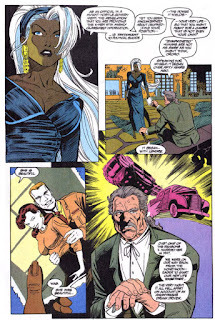 It is suggested here that Xavier telepathically curbed a young Storm's thieving tendencies when he encountered her as a child in Cairo (as seen in Uncanny X-Men #118), though I don't believe that idea ever comes up again. The exo-suit design Storm steals is contained on a floppy disk. 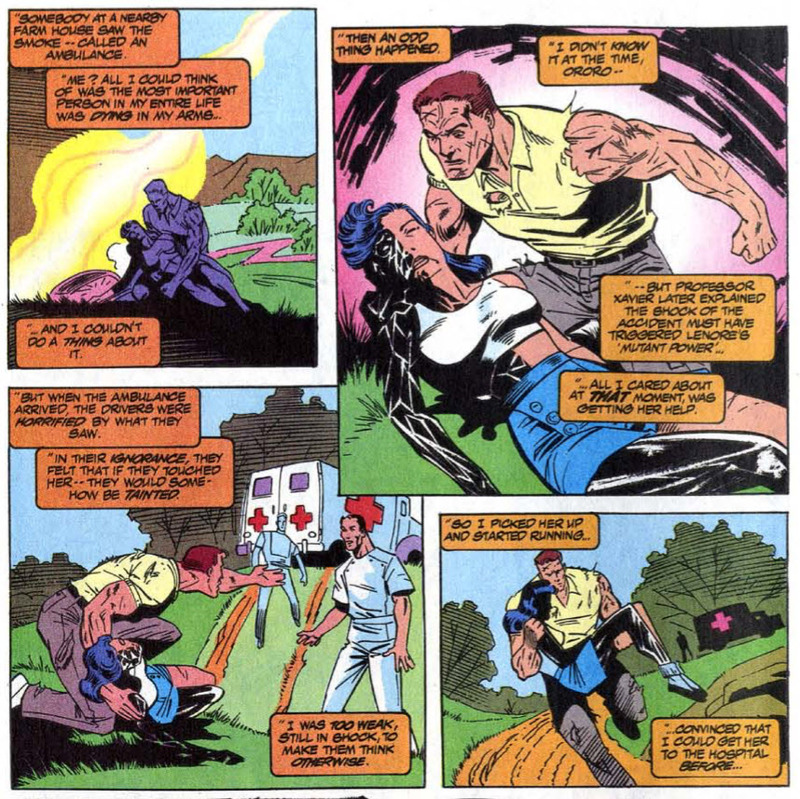 Ambassador St. Croix was motivated to join the Mutant Underground when his wife's latent mutant powers activated during a car crash shortly after their honeymoon; due to her mutated appearance, none of the first responders would help her, and she died. 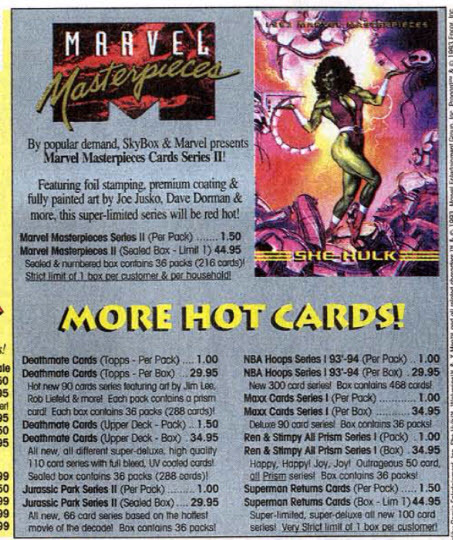 Entertainment This Month is advertising the second series of Marvel Masterpiece cards. 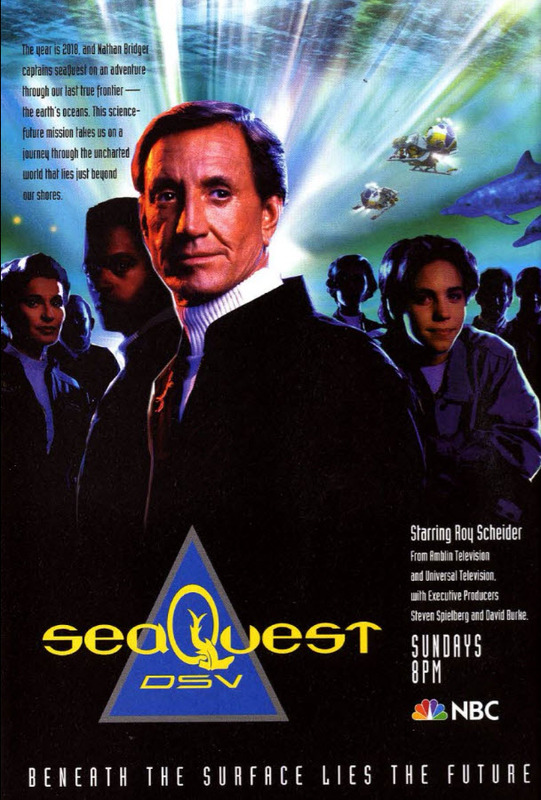 The inside cover features an ad for SeaQuest DSV, starring Jonathan Brandeis (an actor much-loved by one of podcast cohosts). As a kid, this issue always felt like a letdown. Following in the wake of the previous issue's big Magneto event (and running more or less concurrently with the even bigger stuff happening in X-Men #25 & Wolverine #75) and without John Romita Jr. on art, it always felt especially ephemeral and fill-in-y. As an adult, I find the fact that it's already introducing the villains of the next crossover immediately after the series' contribution to the still ongoing current crossover darkly hilarious and a pretty great "snapshot of the 90s", but I've also come to appreciate the Storm/Xavier B-plot. Not only does it continue Lobdell's overall efforts to, if not outright darken Xavier, at least reveal some heretofore unseen rough edges, but Storm's reaction to his actions here represents probably her last notable bit of characterization for some time (at least until Marrow & Gene Nation come along, if even then). As the Blue/Gold distinction continues to fade and the one thing that set Storm apart during that era (that she's one of the two leaders) fades with it, she will be relegated more and more to the background, until her Claremontian heyday as the conflicted but determined shepherd of Xavier's flock is but a distant memory. 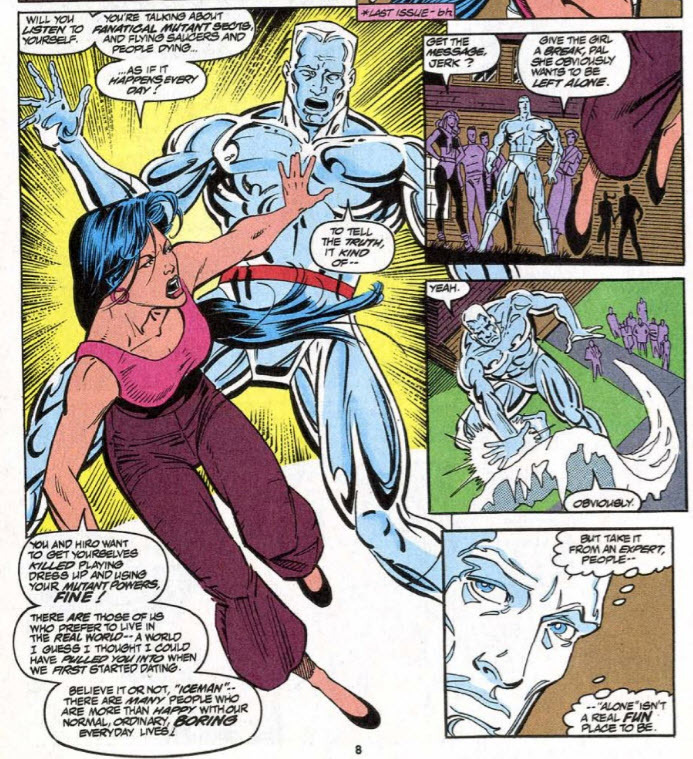 Her standing up to Xavier here and decrying his indulgence of her criminal past is hardly character-defining or of high significance to the narrative, but looking back now, it's far more memorable than the ribbony proto-Phalanx of the A-story. Tomorrow, Random battles Polaris in X-Factor #95. Friday, Jubilee gets revenge in Wolverine #74. Next week, X-Men #25. "As an adult, I find the fact that it's already introducing the villains of the next crossover immediately after the series' contribution to the still ongoing current crossover darkly hilarious…"
Funny, that’s something I’ve always really liked about Lobdell’s plotting. We’re in the midst of “Fatal Attractions” as he introduces the Phalanx. He teases Onslaught directly after “Age of Apocalypse”. He intros Bastion just before “Onslaught” begins. It’s always seemed like a really cool way to at least create the illusion that all this stuff is building naturally as we go along. As a result, where you see this issue as filler, I look at it as a neat tease of the next big crossover. In fact, the lack of Romita Jr. is the reason this was one of the few UNCANNY issues from this era that I bought off the rack. As noted before, I had dropped the series after 300 because Romita’s art didn’t appeal to me. I did read 304 for the crossover, and I picked up this one too because Duursema’s artwork appealed to me way more than Romita’s. But his return next issue caused me to skip it again, and I only ever picked up one more UNCANNY prior to “Phalanx Covenant” (which is where I became a regular reader). Of course I eventually went back and got the installments I missed as back issues, and I’ve since come around on Romita’s artwork, but at the time this one was a breath of fresh air to me compared to what I perceived as Romita’s ugly, blocky characters. "Jan Duursema (incorrectly spelled as "Duuresma" here)…"
Aha! That explains why, for well over a decade, I thought her last name was Duuresma. This would’ve been my first exposure to her, and that misspelling stuck in my head as the default. It was only around 2010 or so that I figured out I’d been wrong that whole time, but I just assumed it had been my mistake. Turns out it was Marvel’s! "Louis will … eventually be established as the grandfather of future Generation X and X-Factor member Monet St. Croix…"
I always assumed this guy was meant to be related to M, but I don’t recall ever seeing it confirmed anywhere. I probably just missed it or didn’t pick up on it somehow. I liked that about Lobdell's writing too, the teasing of long term subplots-until I found out that he teased Onslaught with absolutely zero idea of who or even what Onslaught was. I'm not sure if Claremont-who was clearly the inspiration for seeding long term subplots and coming back to them ages later-ever just came up with something and didn't know what it was going to be, but Onslaught was an example of why that's not a good idea. That it was the basis of a line wide crossover that attempted to reboot a great deal of the line AND bring back the Image guys, though, that was hilarious in hindsight. How 90s Marvel. For some unknown reason, the Louis St. Croix flashback stuck in my head, but I could never remember which issue it was in or its full context. So thanks for answering a somewhat ridiculous mystery. Given Lobdell's tendency for seat-of-your-pants plotting, I wonder if he initially intended the Phalanx to be the fleshy, stringy things we saw here instead of being tied to the Technarch. I think the final form works better, but this version has a fair bit of body horror attached to it. The very next issue shows Hodge in techno-organic form, so if Lobdell changed his mind, he did it in a hurry. I guess it's also possible Jan Duursema mis-drew the Phalanx and there was no time to change the art by the time anyone realized. Montclair, NJ, where Opal lives is also where Patsy Walker's mom's house and once Defenders' headquarters was during/around the JM DeMatteis run of DEFENDERS (right next to Claremont Avenue). It could be a coincidence insofar as the connection to those characters in particular but Montclair is a popular suburb for NYC commuters and its repeated use by writers just makes sense given Marvel’s use of real-world geography. 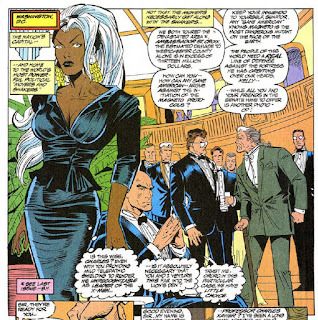 The revelation that Xavier mentally nudged Ororo away from stealing as a child — or even the suggestion of it attended by Ororo’s conviction that it’s entirely possible — feels like a huge deal to me. Did we know Opal had moved to the suburbs in Jersey? "Did we know Opal had moved to the suburbs in Jersey?" ...you didn't receive her change of address card? 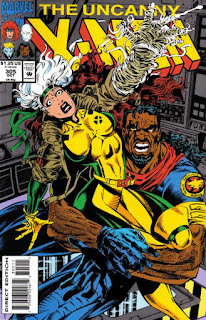 Rogue & Bishop were two of the only X-Men who weren't in the X-Tinction Agenda vs. Hodge. Shouldn't they be more confused looking? Hopefully they were briefed on what happened in Genosha, since it was kind of a major event. I'd just assume someone had previously explained to them, off-panel, who Cameron Hodge was. I have read Xman yet but want to read it now after reading so many good reviews from you in this blog.Let's see now when I will get my hands on it.